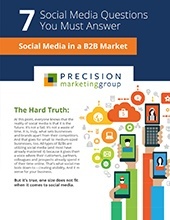 For today's B2B marketing world, the reality is that social media is here to stay, and serious businesses are taking note. Learn how you can leverage these channels to drive lead generation! Has your social media program been starting conversations and building relationships with your target markets? Um, did we just hear you laugh at the mention of a “social media program”? Ready for tips that you can put to use today to get your social media program going? Simply fill out the form to get the guide now!